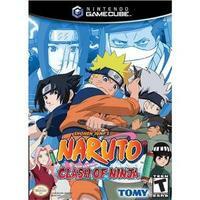 Naruto: Clash of Ninja for GameCube is a cel-shaded fighting game where gamers may choose to play as one of eight different Naruto characters. Naruto takes place in a world where ninja hold the ultimate power. Infused with the spirit of a once fearsome Nine-Tailed Fox, Naruto Uzumaki is a ninja-in-training who is learning the art of Ninjutsu with his classmates Sakura and Sasuke. The trio studies under the instruction of their teacher, Kakashi, who helps the group face dangerous and daunting tests and challenges.